I was searching for some info a while back and ended up on your website. 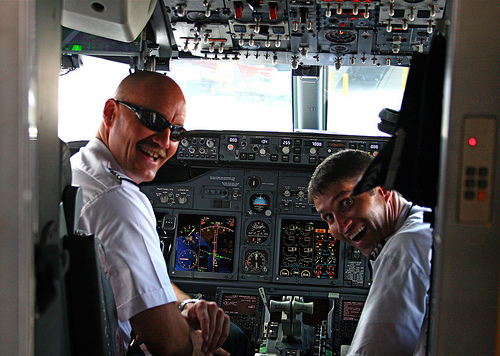 A gentleman by the name of Ron inquired if there were any gay pilots. Yes, there are gay pilots, for which I belong to “the club”. I fly for a major carrier. I apologize for not taking the initiative or opportunity to assist Ron sooner. There is a gay organization called the National Gay Pilot’s Association, which I am on the board of directors. We had a convention in Palm Springs this weekend. I feel bad that I’ve been so busy that I was unable to invite him. The organization is not limited to pilots. We welcome anyone interested in flying. We have pilots, both commercial, and private; flight attendants, air traffic controllers, and Flight Service members; mechanics, sky divers, instructors, and those that are not pilots but just interested in flying, AND all of the above partners. It’s a great group. Anyone can check out our website, which is in the process of being updated, at ngpa.org. I did mention your organization, the National Gay Pilot’s Association, in the Galley Gossip post, a question about dating pilots – gay pilots, but I had no idea anyone could join. Thanks for sharing. Well aren’t you going to join? YOU SHOULD! Yes Iam a Proud Gay flight attendant for Northwest Airlines. Pilots are my lovers, tourists at hotels and one night stands with people where ever I am lost. Men love the little Rob Nelson! I always wanted to know a gay pilot 🙂 men in uniform always excites me! I’m young, pretty and pretty damn smart!